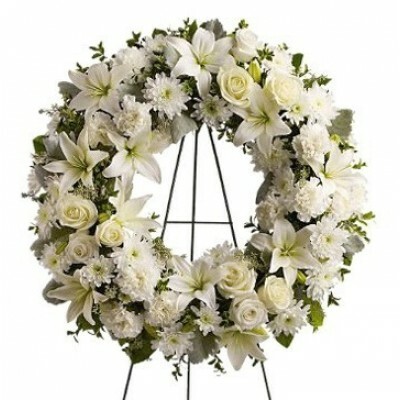 The Serenity Funeral Wreath is as a graceful display of tranquility and affection. This spray will honor the life of a dear friend or family member in Spain with respect and love. For same-day delivery your order must be placed by 2pm Spain local time. The Serenity Funeral Wreath will feature fresh white flowers and lush greens. Floresnaweb will chose the freshest blooms of white flowers to honor the life your special recipient in Spain. The picture is illustrative however the wreath delivered will have the same quality standard. Some flowers and greenery may differ according to availability of our local florist however we guarantee the effect and satisfaction of recipient.